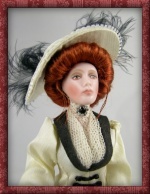 Introducing the perfect addition to your miniature shoppe! 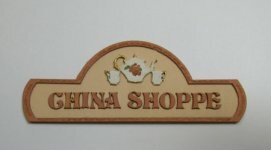 Our shoppe signs have been designed to allow you to create a fabulous looking, three dimensional sign, color coordinated perfectly with the interior or exterior of your building. 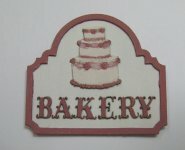 In these kits, you will received a laser cut wooden base on which to assemble your sign. Simply paint this base with an acrylic paint of your choice. Additionally, you will receive a wooden set laser cut scrolled frame or border, silouette, and lettering. 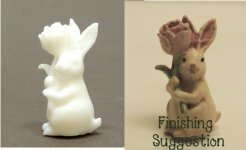 Simply paint these items in a second color of your choice. Then glue them into place onto the base. We have even made that part super easy for you... the placement of the lettering, silouettes, etc. has been lightly scribed into the base piece, so no guesswork involved. Just glue the letters into their marked position. 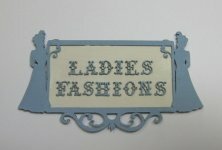 If you have a special sign that you would like us to design and manufacture for you, just drop us an email!